Crush Pad is a wine term applied to a facility that allows the winemaker to produce his or her own brand of wine without having to have his or her own facilities. Some Crush Pads even have their own winemaker. The in-house winemaker can work as a consultant or even oversee the entire process. Crush Pads have also been called Incubator Wineries. The term virtual winery is associated with a Crush Pad. Adora Estate Winery, which opened in 2003, was the Okanagan's first custom crush winery, producing wines for other wineries (such as Calliope, Morning Bay, Cellars at the Rise, Aces Wine Group) and for its own label. In the past two years, Adora has wound down its activities but there are plans to re launch with a new label, a new Summerland winery, and new clients. Coming into prominence today is Okanagan Crush Pad . Okanagan Crush Pad was established in 2011, in Summerland British Columbia, by Christine Coletta and Steve Lornie . It has been established to be a one-stop shop for the wine industry in British Columbia. Their goal is to provide assistance every step of the way from the field to the marketplace. Clients can choose from a shopping list of services ranging from vineyard management and winemaking to branding, marketing, communications, and sales distribution. Okanagan Crush Pad is the first facility of this kind in the Okanagan Valley. Okanagan Crush Pad's team of industry leading consultants offers vast knowledge and proven track records to help clients with whatever their need is in the wine business. Okanagan Crush Pad welcomes the opportunity to explore clients' needs and work with them to bring their ideas to fruition. The facility is now open to the public and is designed as a co-working space for winemakers to work side by side to share ideas and to collaborate. The design aesthetic ‘less is more' is expressed in the state-of-the-art wine cellar with exceptional wine as the outcome. The look is clean, crisp, and modern. Okanagan Crush Pad is excited to be the first in Canada to use egg-shaped concrete fermenters from Sonoma Cast Stone in Petaluma. 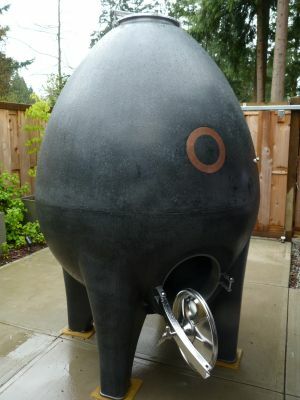 Okanagan Crush Pad has six eight foot tall “eggs” at their winery. The Okanagan Crush Pad team conducted research at Alberto Antonini's urging and came to understand that using concrete fermenters is an old school technique that is making a big splash in the tech savvy new world. Concrete has been used for centuries in winemaking, but these egg-shaped tanks take a forward- thinking approach using modern features such as temperature control tubing. These tubes are embedded into the walls of the eggs and are engineered for use in concrete for radiant heating and cooling. This provides even temperature throughout the tank and no parts that requires cleaning come into direct contact with the juice. There is also an impact on the flavour development of wine when concrete is used. Like oak vessels, which are commonly used in winemaking, concrete is slightly porous, allowing the wine to breathe as it would in oak. However, unlike oak, the eggs leave no oaky flavour as they gently diffuse oxygen. Concrete is considered neutral, like stainless steel, and imparts no flavours of its own. The concrete tanks are unlined and they permit a measured but lasting flow of oxygen into the tank throughout fermentation and aging. The tank's egg shape means more of the cap (skins and pulp floating on top of the juice in red-wine fermentation) stays submerged. According to Sonoma Cast Stone, this lengthier contact of the skins and pulp with the juice means wines come out brighter with higher fruit notes and prettier secondary aromas that you don't tend to find in wines fermented in stainless steel. The facility has a very strong winemaking team. The head winemaker is Michael Bartier. Alberto Antonini is the Consulting Viticulturist/Winemaker. He has experience working with egg-shaped concrete fermenters from Sonoma Cast Stone. The man in charge of Public relations is David Scholefield, who has an earned reputation as one of the most discerning tasters and wine experts in Canada. Open to the public: No. Orders placed in advance can be picked up on site at a pre-arranged time. From Field to Market is used by Okanagan Crush Pad to describe all the services they offer. From vineyard management to licensing, marketing, and distribution. For a puppy to be considered a winery dog, does it need to live at the winery? Okanagan Crush Pad Winery owners Christine Coletta and Steve Lornie are asking the question, as it relates to their sponsorship of a puppy from Pacific Assistance Dogs Society (PADS). PADS is a non-profit organization that raises and trains dogs to assist those with physical disabilities or who are deaf or hard of hearing. As a puppy-in-training, can young male black Labrador "Summerland" still be labeled a winery dog if he lives with puppy raisers and then does advanced training at PADS headquarters in Burnaby? Winery owners Christine Coletta and Steve Lornie have a long history of loving black Labrador Retrievers. Family pets Echo and Acadia are both black Labradors. As such, it was only fitting to help by sponsoring "Summerland", a nine-week-old black lab puppy from PADS. Raised to help someone with a physical disability or someone who is deaf or hard of hearing, PADS dogs like Summerland help people in the community to gain independence. PADS also has Canine Assistance Therapy program dogs working with the elderly, children with autism, or helping in schools. Coletta is a strong supporter of PADS, and a recent addition to the PADS board of directors. Okanagan Crush Pad also has a wine campus . There are two components (1) Annual scholarship of $5000 to the BC Hospitality Foundation towards wine studies. (2) Vancouver's Sommelier of the Year is invited to make 100 cases of wine at Okanagan Crush Pad. This year Kurtis Kolt (2010) and Owen Knowlton (2011) have completed their wine projects. The latest winner, Terry Threlfall (2012) is set to go. Crush Pad now ( spring 2013)has 12 wines on its roster (including house brands Haywire and Bartier Scholefield) and in less than two years has doubled its production of critically acclaimed wine from 17,000 to almost 34,000 cases. They were awarded Most Innovative Company in BC.